Our aim is to enable our client’s mechanical systems to operate reliably at all times. We are a specialty contractor who can safely tackle the most complex problems and provide and effective solution. MBS Engineering saves you money, by offering tailored maintenance programs, designed specifically for each client. By managing repairs and maintenance on an ongoing basis, we’re able to provide consistency and develop an intimate knowledge of equipment, allowing us to repair or replace items before they cause any major problems. MBS Engineering offers a full range of maintenance services to companies with complex plant and project support needs. Click image to download guide. Remember, it is the responsibility of the property owner, manager, tenant or occupant to maintain the gas lines on your side of the meter. For property managers, it is always better to be proactive by auditing and managing your gas systems rather than reacting to potentially high risk issues. 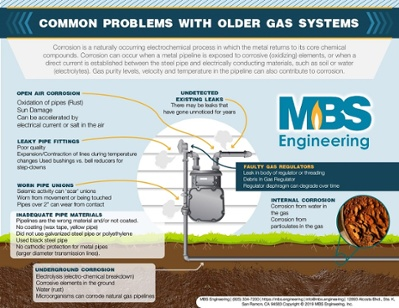 MBS Engineering Gas Maintenance Program is a yearly Auditing, Testing and Reporting service for your property’s gas system to identify, test and prevent gas related issues caused by aging or obsolete equipment. MBS starts by reviewing your gas map or mapping out your facilities gas system. 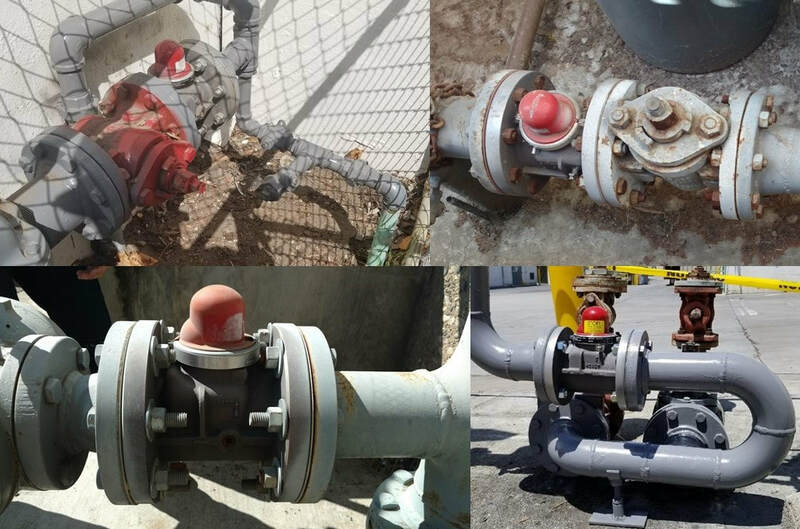 We provide a detailed report of all of the gas system components such as seismic valves, gas regulators, and manual shut-off valves detailing the compnent's condition, model numbers, and location. 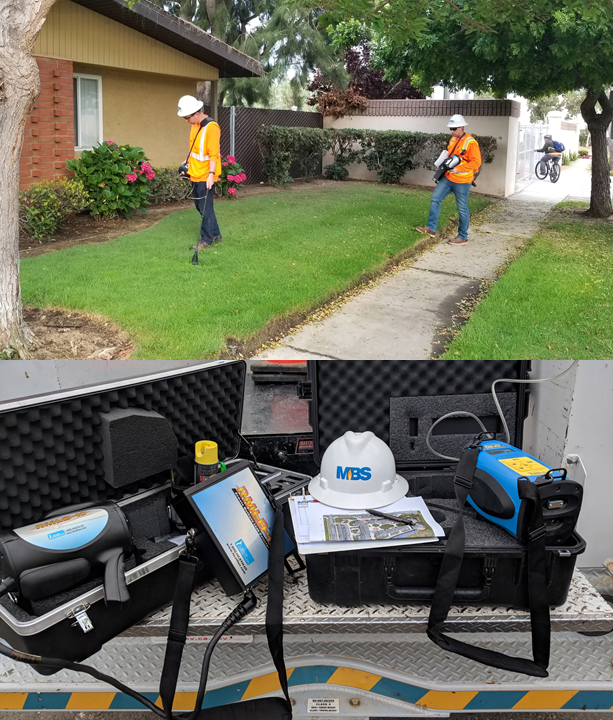 MBS utilizes the same highly advanced leak detection equipment used by most utility companies. Our factory trained personnel are trained to complete a comprehensive gas leak survey for any type of property. Our surveys are designed to locate leaking, corroded gas lines. Equipment leaks can easily go undetected for a long period of time, and can lead to catastrophic property damage and risk to people. Leak Detection Survey on all exposed gas lines on the property. Use of DP-IR (Detecto Pak-Infrared) made by Heath US zeros in on gas leaks, measures concentration, and determines classification. All MBS employees are factory trained and certified technicians. 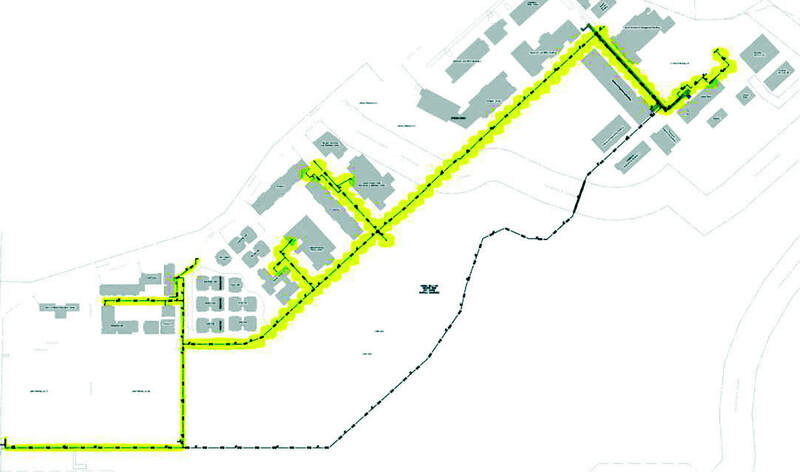 Site survey assessment is provided once survey is completed, followed by a more detailed report. If natural gas leaks are discovered, our Find It, Fix it Program offers the services needed to quickly and efficiently repair any leaks to your gas lines and get you back to business as quickly and safely as possible. Seismic shut off valves are required for use by the State Architect Division of California on all Natural Gas Lines. 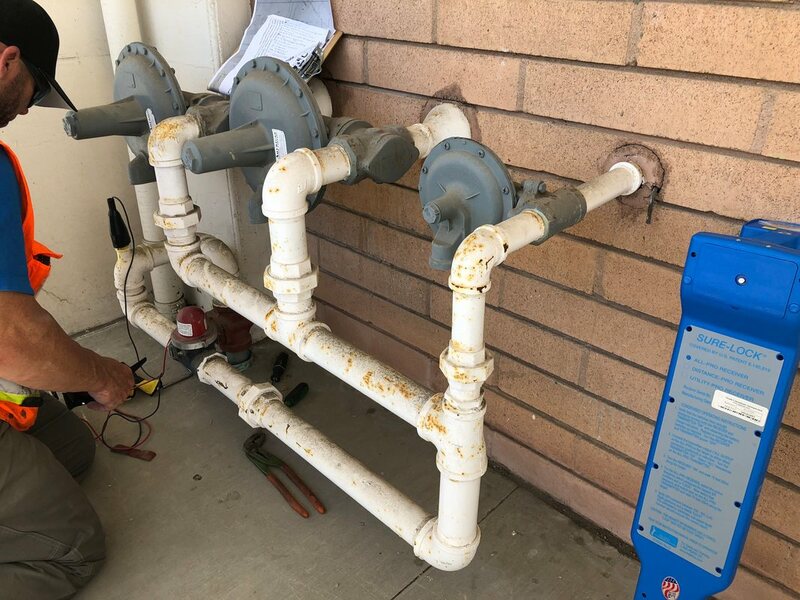 MBS Engineering inspects all existing seismic valves in place and recommends the proper types of earthquake valves to install on existing gas lines if a seismic value is not currently installed. In the event of an earthquake, seismic shut off or earthquake valves will close to prevent gas flow into a structure. 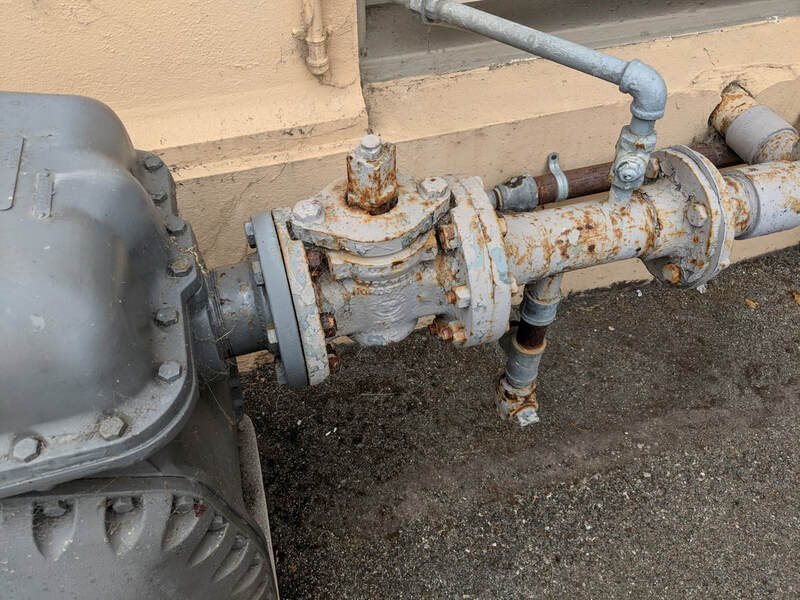 Having this valve installed will greatly reduce the risk of explosions or fires that may coincide with earthquakes and any damage to gas line integrity that may occur. Gas Regulators are safety devices used on all gas lines to control an incoming higher gas pressure down to a desired lower gas pressure to feed downstream equipment and processes. There are several issues that faulty regulators can cause including venting of gas out of relief vents, lock up issues and drop in regulator set point to name a few. These can not only cause issues with the efficiency and life span of downstream equipment, but can also raise safety issues within the gas system. With the MBS Engineering Maintenance Program, we will verify outlet pressure set points on all regulators as well as recommend replacements for any gas regulators that are experiencing issues. Manual Shut Off Valves allow an easy way to shut off and isolate gas lines within your gas system. Manual Shut Off Valves that are not properly maintained by regular exercise can cause serious safety issues since manual valves can become corroded and frozen over time. In some situations, properties have only one manual gas shut-off valve location which is commonly near the main gas meter. The location might be difficult to access, and could result in increased danger in the event of an emergency. MBS Engineering will inspect and exercise all valves within the system and make recommendations for valve replacement, if needed. 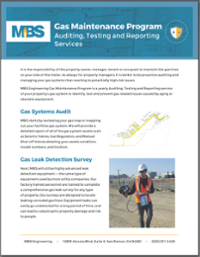 Once we have completed our gas maintenance program, MBS creates a detailed gas system report for the property owner or manager. Each section covers your gas system assets, inspection results and outlines recommendations for training, maintenance or repair to keep your gas system properly maintained, performing efficiently, and is safe. ​As part of the MBS Engineering Gas Maintenance program, we offer a training program that includes 2 hours of gas safety training by our Gas Safety Expert. This training includes Natural Gas Safety practices to follow for your whole gas system. A safety certificate will be provided to each attendee. Want more information on our Gas Maintenance Programs? By engaging MBS Engineering to provide regular inspections and evaluations of plant and equipment, you will save money on repairs as equipment is properly monitored and preventative maintenance is conducted before expensive problems arise. Our mechanical contractors are highly skilled, qualified technicians who work to consistently high standards and document procedures to ensure continuing consistency. This allows us to provide services to clients with multiple facilities under one service agreement. ​​Regular inspections and service by MBS Engineering will not only save money on repairs and maintenance, they will improve the capacity and extend the life of your equipment, lower your utility bills and increase the productivity of your workforce.